It's official: Michigan's home health care "dues skim" has ended. For the first time since 2006, the Service Employees International Union is not deducting money from the Medicaid checks of the state's 59,000 home-based caregivers. James Haveman, director of the Michigan Department of Community Health, confirmed that the money no longer is being taken from the checks. "The Department of Community Health successfully ended the contract with the SEIU and, in turn, stopped the dues from being taken out of Michigan home health care worker paychecks," Haveman said. "Making this happen was a priority for me and our administration and I’m glad to see that with this next round of paychecks this has become a reality." The SEIU, however, took $34,416,335.21 from the elderly and disabled in Michigan, according to the Michigan Capitol Confidential skim tracker, an online scrolling ticker that was tracking the money the SEIU took. In the meantime, the Mackinac Center Legal Foundation has taken legal action in an attempt to get some of those dollars returned to the caregivers. That case with the Michigan Employment Relations Commission is still pending. "The dues skim went beyond the usual controversies and battles involving government unions," said MCLF Senior Attorney Derk A. Wilcox. "It was a scam that government allowed a union to perpetrate against home-based caregivers. This forced unionization was a one-sided arrangement by which the union profited without providing equivalent services. "What continues to amaze is that other unions still rhetorically defend it," Wilcox continued. "Do they really want this scam to be used as an example of a union? If so, it speaks volumes about how far union leaders have wandered off course." 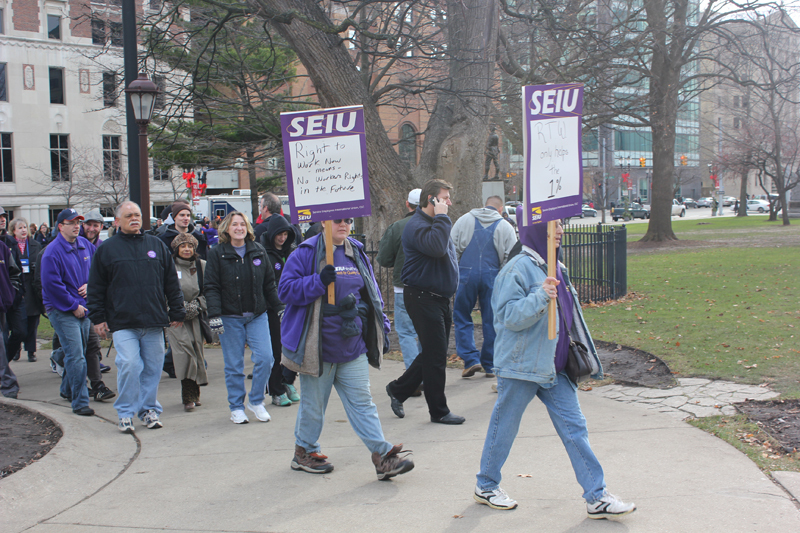 In an effort to increase dues-paying members, the SEIU targeted the Medicaid checks of Michigan's home-based caregivers. A forced unionization, in 2005, was used to force the caregivers into the SEIU. Key elements of the scheme included a dummy employer, a stealth by-mail election, and avoiding any media attention. The scheme was set up when Jennifer Granholm was governor. This week marks the first anniversary of Gov. Rick Snyder's signing of legislation that was drafted to outlaw the skim. "From the moment I became aware of the unionization of private home help workers I knew something just did not seem right about it," said Sen. Dave Hildenbrand, R-Lowell, the sponsor of Senate Bill 1018, which was signed by Gov. Snyder. "Throughout the discussions and testimony received on this issue it became quite clear that these individuals where not state employees, a critical component necessary in order to be organized under the statute that the original unionization was authorized through. "In fact, in many cases these were relatives providing assistance to a loved one and ultimately all employment decisions were the responsibility of the person receiving the care," Sen. Hildenbrand added. "This crafty deal, made behind closed doors, to skim state Medicaid dollars from these individuals’ checks was just wrong and I am glad we were able to put an end to it." According to the most recent information provided to the Michigan Department of Community Health, 63 percent of the caregivers were friends or relatives of the person for whom they were providing care. The SEIU went to great lengths to continue taking the money, including putting Proposal 4 on the 2012 statewide ballot. Had Proposal 4 passed, the forced unionization would have been locked into the State Constitution. But the voters of Michigan solidly rejected it. Just days before the 2012 general election, Gov. Snyder replaced the entire MQC3 board. The new board announced that there would be no contract extensions and the dummy employer, the Michigan Quality Community Care Council, would be dissolved in April 2013. Russ Knopp, one of the replacements Gov. Snyder put on the MQC3 board, said the MQC3 has successfully been dissolved. Knopp, the owner and operator of Comfort Keepers of Northwest Michigan, an elder care company in Traverse City, gave a general description of the last MQC3 board meeting. "The registry has been moved over to the department (MDCH)." he said. "It is up and running and has been tested already. It also looked like the last box of files was in the process of being transferred from MQC3 to the department. "That was our last board meeting. The organization has been disbanded." The primary function of the MQC3 board in its final months of existence had been to facilitate a smooth transition under which the MDCH would take over the registry of home-based caregivers. Maintaining the registry of workers that had undergone background checks might have been the only thing of real value that MQC3 actually provided. Its only other major function seemed to be making sure the union received money taken from the elderly and disabled. However, the registry's usefulness was minimal. It accumulated just 933 names over a six-year period. It appears to have been initially assigned to the MQC3 to add a veneer of legitimacy to the scheme by providing the dummy employer with a function. Zac Altefogt, spokesman for SEIU Healthcare Michigan, did not respond to a request for comment.